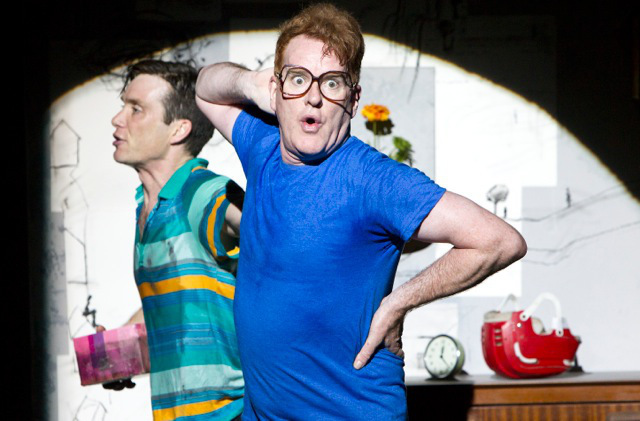 The pull quote for The Telegraph’s review for Edna Walsh’s Ballyturk is simply ‘hard to fathom’ – well, they got right. Twice I have been pulled into the Lyttelton for a Cillian Murphy / Edna Walsh collaboration and twice I have left frustrated with the outcome. The high points have remained the same and they lie in the wonderful sets created by Jamie Vartan and in the virtuoso performances by the cast. In Misterman, Vartan turned the Lyttelton’s stage into a cavernous warehouse that seemed to stretch endlessly into the distance, whilst Murphy was magnificent in a performance of spectacular energy and verbal dexterity. My main reservation was the play seemed to operate under the illusion that it was a far more complex than it really was. The ending, presented as a big reveal, was something that could be seen a mile away. Well in Ballyturk, Vartan creates another ingenious set and Murphy gives another high-energy performance. 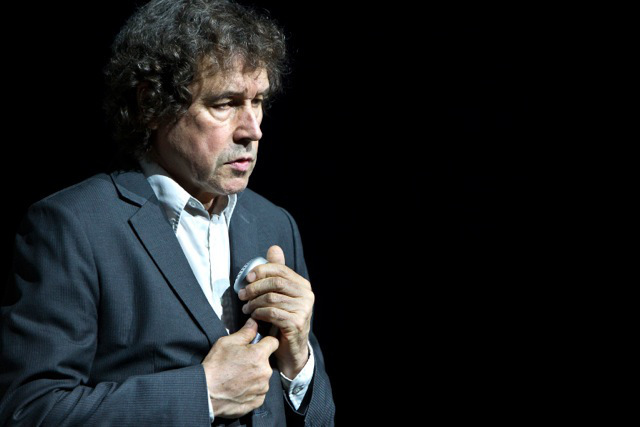 This time he is joined by Mikel Murfi, who is given every chance to showcase the benefits of a Jacques Le Coq schooling as he is jumps nimbly into the shoes of an entire Irish village’s worth of characters, and also by Stephen Rea, playing a languid, louche Stephen Rea-character. The cast are all excellent in what they are asked to do. There are issues with the clarity of their speeches but this feels more of a studied directorial decision to give the play a frenetic feel in order to keep the audience off-balance at all times. Played on the edge of mania it is exhausting just to watch; The sudden explosions of music, the high-octane performances, the rapid fire dialogue, the conversational tics and character changes ensures that the 90 minutes is a mental strain. This issue of pacing adds to the generally frustrating experience of watching a play that uses opacity as a tool to make a relatively simple ‘locked-room’ mystery appear deceptively complex. Walsh uses every trick in the book to disconnect the viewer from the narrative, as if he fears that the more they are able to tune in, the more they will notice the fraying around the edges. The ghost of Beckett looms in the background of Walsh’s work; Murphy and Murfi are nameless characters, simply referred to as ‘1’ and ‘2’ in the script, but it is hard not to see the spirit of Vladimir and Estragon within them. Where Beckett gives them vaudevillian qualities, Walsh channels the three stooges, but the intended effect is the same; it is comedy that cuts through the fear of the unknown. There is no sense of time within the space and the mania could have lasted for ten days or ten years. It is funny the first time, troubling the second time and terrifying if seen for the thousandth time. The problem is that Walsh does not retain Beckett’s ferocious control over language. Rapid-fire dialogue and nimble verbal tricks are fine but it requires a script to be worked continuously to eliminate everything unnecessary. Whilst the interchanges in the village are occasionally wonderful and the voices that emanate from the walls have a truth even as they exist in abstract absurdity, the monologues too often strain to reveal a deeper truth. Walsh desperately wants his work to exert a deeper meaning and suggest a metaphysical hinterland but too often the hand of the author is apparent in shaping the characters’ dialogue and they give voice to words that could never be their own. It is rare that Civilian Theatre criticises playwrights for trying to channel Beckett, however in the case of Walsh it is a frustration that he does not recognise where his true talents lie. Like many of his countrymen, Walsh has a remarkable facility for bringing to life a whole community within snippets of dialogue. If he could only be persuaded that the world he can create is more interesting than the world he wants to create then it is entirely probable that he could produce a play to rival his breakthrough work, Disco Pigs. 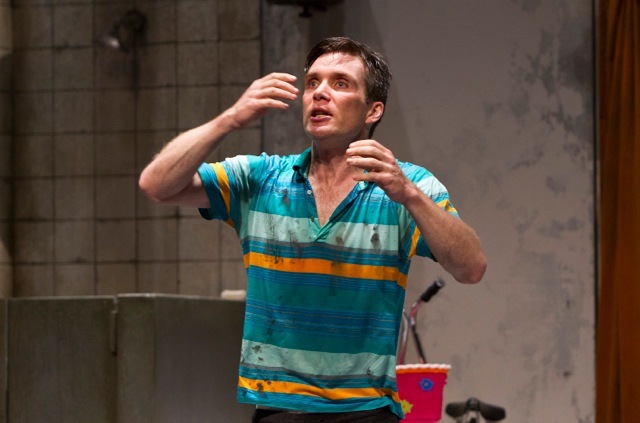 Unfortunately, Ballyturk – like Misterman – is not it.